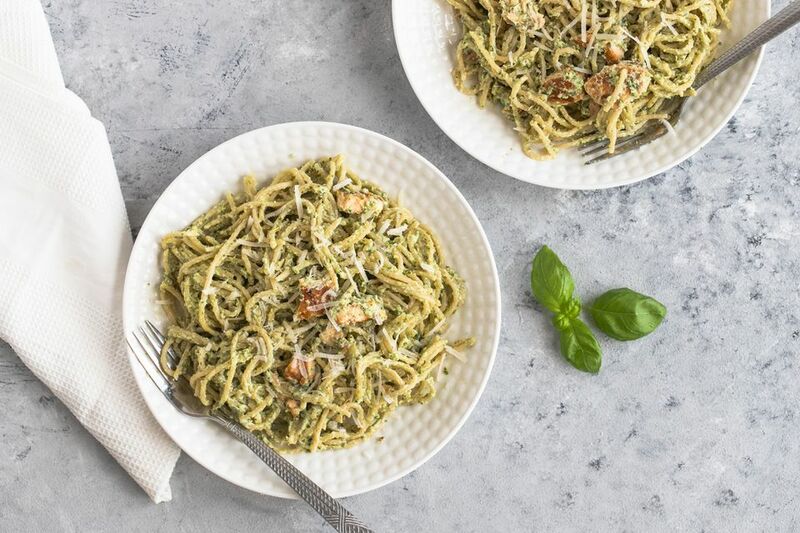 This super easy and elegant recipe for pesto salmon pasta is perfect for company. Plan it into your menu for the week; have grilled salmon steaks one day and grill two extra, then refrigerate, covered, until you make this recipe a day or two later. You can also use salmon that you cook specifically for this recipe. Season the salmon any way you'd like. We prefer using olive oil, lemon juice, salt, pepper, and dried basil. You can use any long pasta, like fettuccine or linguine, in place of the spaghetti. You can use nonfat half-and-half in place of the cream and low-fat sour cream in place of regular sour cream. But don't use both nonfat versions of these dairy products, because the texture of the dish won't be right. It will be too thin and may become grainy. We have made this recipe with hot smoked salmon in place of the grilled salmon steaks. Just break the salmon into chunks, use about 1/2 pound and add to the recipe when directed. We haven't made it with canned salmon, but that would work in a pinch. Because the dish is so simple, it's perfect for entertaining, especially if you are a beginning cook. This pasta dish tastes like so much more than the sum of its ingredients! Serve this easy and elegant dish with some toasted garlic bread and a fresh green salad tossed with grape or cherry tomatoes and a simple vinaigrette dressing. Remove the skin and bones from the cooked salmon. Gently break into large pieces. Set aside. Bring water to boil in a large pot over high heat. Add some salt to the boiling water, then add the pasta and stir. When you've added the pasta to the water, whisk together the pesto, cream, and sour cream in a large saucepan. Heat this mixture over medium-high heat for 3 to 4 minutes, stirring frequently with a wire whisk. Stir the salmon pieces into the cream mixture with a wooden spoon and continue heating over low heat; the mixture will start to simmer. Drain the pasta when it is cooked to al dente. Add the drained pasta to the salmon mixture along with half of the Parmesan cheese. Turn the heat for the saucepan to medium and cook, tossing the mixture gently with tongs until the spaghetti is coated and the mixture is thoroughly heated. Serve immediately with the remainder of Parmesan cheese.